The DTU Non Teaching Hall Ticket 2019 is very necessary for the aspirants who are appearing for the examination. The release date of the admit card is yet not announced by the officials. Soon after the official announcement about the examination date and the admit card release date, we will post the news on our page. Visit the official website dtu.ac.in for more information. You can also find recruitment notifications in the next sections of this page. Moreover, you can also find the steps to download the DTU Call Letter 2019. Delhi Technological University is conducting the examination for the aspirants who applied for the posts of Non Teaching – Junior Officer Assistant, Office Assistant, Senior Office Assistant. There are totally 35 vacancies. Candidates registered for the posts will get their admit cards in the month of March 2019. Moreover, the examination will be conducted in the month of March 2019. The selection process for the DTU Non Teaching mainly consists of 2 rounds. Aspirants who meet the eligibility criteria are promoted to the preliminary round, which is a written test. Candidates whoever clears the written test will be promoted to the next round i.e., personal interview. Finally, the shortlisted candidates will be recruited for the corresponding posts. List of mandatory documents is given below. Carry any of these documents to the examination center. Any Authorized ID Proof Issued by Gazetted Officer. Instructions to be followed during the Exam. Visit the Delhi Technological university official website @ dtu.ac.in. You will get the home page of the website. On that home page, you can find the latest news section. 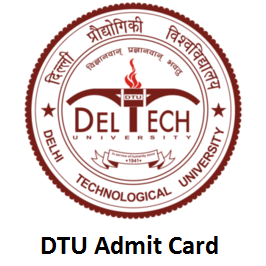 Go to that section, search for the required link to download the DTU Admit Card 2019. Fill the complete details asked. Before submitting it, check the details once again. Click on the submit button and download the admit card. Make a copy of that admit card and carry it along with you while attending the examination. Candidates can note that the exact dates of the examination and release of the admit card are not yet released. It is notified that the admit cards will be issued in the month of March 2019. After the official announcement about the details, we will update the news. Hope that the information mentioned is useful. For any related information visit our website freshersnow.com freshersnow.com.